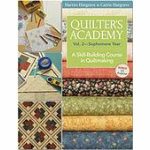 A Skill Building Course in Quilt making Bonus 13 projects This classic series of comprehensive books takes your customers from the basics to complete mastery with easy to follow lessons and hands on exercises. After learning the fundamentals in Volume 1, quilters take on drafting exercises in Volume 2. Drafting exercises show how to make any quilt, any size, with or without a pattern.